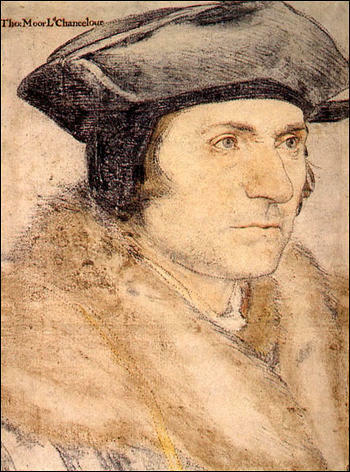 Classroom Activity on Sir Thomas More: Saint or Sinner? 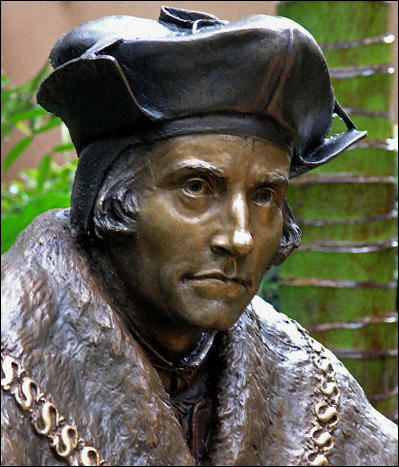 Sir Thomas More - Saint or Sinner? In 1516 Thomas More wrote a very important book called Utopia. The book tells of a seaman who has discovered an island called Utopia ("Utopia" is Greek for "nowhere"). The people on this island live in a completely different way from the people of Tudor England. In his book people elect their government annually by secret ballot; wear the same kind of clothes and only work for six hours a day. There is no money or private property on the island. Free education and health care is available for all. All goods are stored in large storehouses. People take what they want from the storehouses without payment. Both men and women can be priests. People are able to hold whatever religious beliefs they want. Some people claimed that in the book More was describing his vision of what England should be like. Others claimed that More had written a book that was supposed to make people laugh because he thought it was a ridiculous idea. Henry VIII was impressed by Thomas More and by 1518 "More acted in effect as the King's secretary". This led to a series of important posts such as Treasurer of the Exchequer (1521) and Chancellor of Lancaster (1525). He also served as Speaker of the House of Commons. In 1529 he replaced Cardinal Thomas Wolsey as Lord Chancellor. This was the most important government position in England. In November 1534, Parliament passed the Act of Supremacy. This gave Henry VIII the title of the "Supreme head of the Church of England". A Treason Act was also passed that made it an offence to attempt by any means, including writing and speaking, to accuse the King and his heirs of heresy or tyranny. All subjects were ordered to take an oath accepting this. More refused to take the oath and was imprisoned in the Tower of London. 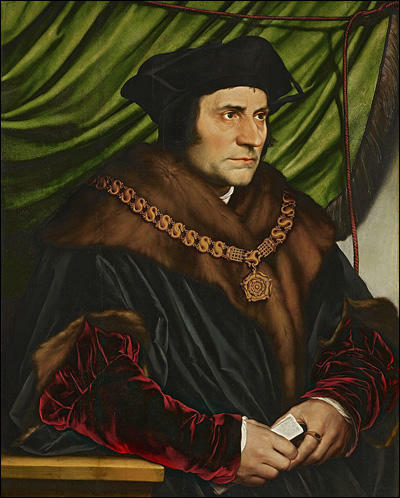 Sir Thomas More was executed on 6th July, 1535. Thomas More chose the authority of Pope Clement VII over that of the English king. In 1935 he was canonised by Pope Pius XI and who was made patron saint of politicians by Pope John Paul II in 2000. Hilary Mantel has recently come under attack for her account of Sir Thomas More in her novels, Wolf Hall (2009) and Bring Up the Bodies (2012). It has even been suggested that Mantel's "anti-Catholicism" is a product of her convent education. However, it was the recently broadcast TV drama based on her novels that has increased the amount of people accusing her of being a "fierce critic of Catholicism". This classroom activity takes a look at the way that More has been portrayed by artists, novelists, historians, journalists and religious leaders over the last 500 years. More was the first Englishman seriously to experiment with the novel idea that girls should be educated too. This may have been partly due to the fact that he had three daughters and an adopted daughter but only one son, and was undoubtedly helped by the fact that the eldest girl, Margaret, turned out to be unusually intelligent and receptive. Sir Thomas More, whose daughters were renowned examples of womanly erudition, as well as the shining examples of both Catherine of Aragon and Catherine Parr who proved that women could be both learned and virtuous, the Renaissance concept of female education became accepted and even applauded... in Henry VIII's time, the education of girls was the privilege of the royal and the rich, and its chief aim was to produce future wives schooled in godly and moral precepts. It was not intended to promote independent thinking; indeed, it tended to the opposite. The picture of More is dark. More was a man of his time and heresy was the big sin, really, it was the big wrong on both sides. It is hard for us in our modern mentality to see it as wrong. They looked on heretics as we look upon drug traffickers. But it is inaccurate to say that he (St Thomas) condemned people to death. We should remember Wolf Hall is a work of fiction. It is an extraordinary and perverse achievement of Hilary Mantel and BBC Drama to make of Thomas Cromwell a flawed hero and of St Thomas More, one of the greatest Englishmen, a scheming villain. It is not necessary to share Thomas More’s faith to recognise his heroism – a man of his own time who remains an example of integrity for all times. It would be sad if Thomas Cromwell, who is surely one of the most unscrupulous figures in England’s history, was to be held-up as a role model for future generations. Why does Wolf Hall demonise one of the most brilliant and forward-looking of all Renaissance people? Its caricature of Thomas More as a charmless prig, a humourless alienating nasty piece of work, is incredibly unfair... Why did Hilary Mantel choose to portray him in a way that flies in the face of all the evidence? Hilary Mantel's Tudor novel, Wolf Hall is a kind of one-volume compensation for all the times the Man Booker prizewinner has been bought and not read. And that's the trouble. Because it's so readable, so convincing, it risks being taken as a true version of events. And that's scary. Because one of the things it does is to reverse the standing of two Thomases: Cromwell and More. The novel does a grave disservice to More who was, whatever else you say about him, one of the great men of the Renaissance. In Wolf Hall, you don't get the author of Utopia, Erasmus's favourite companion (these things are mentioned but with a sneer). You don't get the humanist and the humorist. What you get is a heretic-hunter, whose wit is turned to dry sarcasm and whose world view is simple religious fanaticism. This is Robert Bolt's A Man for All Seasons turned on its head. Granted, Bolt's play wasn't historical verity either but it was, in depicting Thomas More as the martyr of conscience, truthful. All right, historical fiction is just that: fiction. But nowadays, we know so little history, the Wolf Hall version may well pass for reality, especially when it's true to some extent (the sympathetic portrait of Cardinal Wolsey is perfectly credible). Certainly its prejudices are congenial to the liberal-individualistic mindset that dominates our intellectual life. We may read the novel, or at least the reviews; and that's what's going to stick. Thomas More is here a dogmatic persecutor of heretics (which he was), a man perhaps unhealthily obsessed by his daughter Meg (which he may have been), and someone who makes cruelly unfunny jokes about his second wife, Dame Alice (which he did). He is not much else (although he was). Here Mantel’s revisionary eye seems cruel, or to have missed something. Her Wolsey has an instinctive ability to see into events and into people, and has wit and warmth. Her More is a stubborn old Catholic sexist. Holbein presents the public figure, robed in authority (for all his saintly reputation More was ferocious enough to condemn heretics to be burnt.) The determined severity of countenance betrays little of the retiring scholar, although this is suggested in the figure's slight sloop. More was certainly concerned with the impression he made, insisting on having the flamboyant cuffs on his official costume replaced by ascetic plain ones. A man and woman... who hope to live more quietly and merrily... can be divorced and married again to others.... No pleasure is forbidden that causes no harm.... It is lawful for every man to favour and follow what religion he wants. He can bring others to his opinion... so long as he does it peaceably, gently, quietly and soberly.... The only way to the wealth of the community, is equality of all things. More had maintained a long and savage war of words with William Tyndale, whom he regarded as an abominable heretic, fit only for the flames. William Tyndale... had decided that the people needed to be able to read scripture for themselves instead of trusting the church to explain it to them honestly and fully. He believed that the corruption of the church was tolerated only because people didn't know any better-and the church wasn't about to teach them any better, or its excesses and privileges would be in danger. When his books-especially the New Testament began to be widely read in England, the bishops and prelates of the church did everything in their power to condemn them and point out their "errors." In 1527, they convinced the king to ban all Tyndale's works in England. Meanwhile, Cuthbert Tonstal, the bishop of London, worked with Sir Thomas More to find a way to keep the translations out of the public's hands.... Tonstal publicly burned all the copies he had bought. Bayfield now took on the role of the main supplier of prohibited reformation books to the English market, a role vacant since the arrest of Thomas Garrett in 1528.... Bayfield showed signs of not always appreciating the extreme danger he was in. He had indiscreet conversations with people who did not share his views. He was arrested at a London bookbinder's, possibly in October 1531, imprisoned, and interrogated by More.... He was convicted as a relapsed heretic, degraded, and burnt with excruciating slowness at Smithfield. (Source 18) Lord Chancellors and Executions for Heresy in England and Wales. The vigour with which More pursued heretics through the courts was mirrored by the relentlessness with which he fought them... The times demanded strictness, he repeatedly argued, because the stakes were so high. No other aspect of More's life has engendered greater controversy than his persecution of heretics. Critics argue that as one of Europe's leading intellectuals, and one with particularly strong humanist leanings, More should have rejected capital punishment of heretics. His supporters point out that he was a product of his times, and that those men he most admired... lamented but accepted as necessary the practice of executing heretics. Once the Reformation broke out, conspiracy took on more sinister and far more cosmic proportions, but nevertheless the conviction prevailed that heresy and its uglier stepsister sedition were the product of tiny groups of conspiring individuals determined upon private profit. Despite the extraordinary speed with which Protestant ideas spread and their obvious association with the basic economic, political and psychological needs of the century, More... continued to view the religious upheaval as the work of a handful of evil men and women set upon corrupting innocent but, alas, gullible subjects. Since More was known to be an avid hunter of heretics, it was evident proof that Henry did not wish to disavow the orthodox Church. In fact, More started his pursuit within a month of taking his position he arrested a citizen of London, Thomas Phillips, on suspicion of heresy... It was the beginning of the new chancellor's campaign of terror against the heretics. 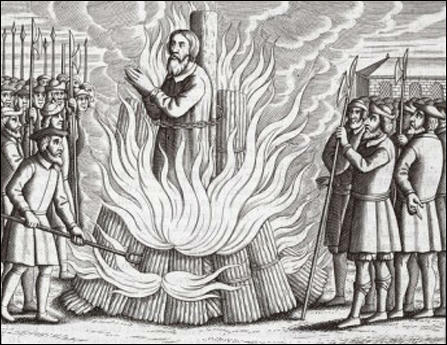 Apart from other factors, these heretics were burned when More was Chancellor because they refused to recant, or, having recanted, relapsed into heresy, whereas in Wolsey's time all the heretics whom he examined recanted at their trial. But there is no doubt that at least part of the reason is that More was a far more zealous persecutor than Wolsey. Question 1: Study sources 2 and 3. Do these sources suggest that Sir Thomas More was in favour of all young girls being educated? Question 2: Read sources 4, 5, 7, 8 and 9. Make a list of the criticisms that these people make of Hilary Mantel. Question 3: Study sources 1, 6 and 20. Do you think these works of art provide an accurate representation of Sir Thomas More. It might help you to read about the artists, Hans Holbein and Louis Laumen, and to look at source 10 before answering the question. Question 4: Read source 21. What criticisms does Lacey Baldwin Smith make of Sir Thomas More. Question 5: Study sources 12-17. Quote from the different sources to explain why Sir Thomas More was so hostile to William Tyndale. Question 6: Study source 18. Do these statistics support the views of the authors of sources 4, 9, 19, 22 and 23?